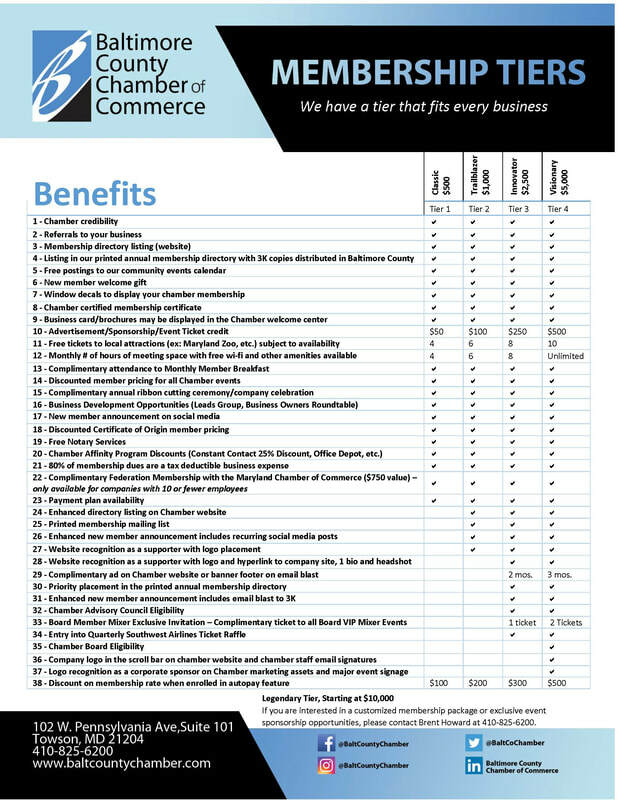 We have a membership tier that will fit every businesses needs. Each tier is designed to provide you with the level of benefits that will help your business grow. There is an additional discount for signing up for our recurring payment plan, as well as, chamber credits to help offset the cost of attending events, advertising, or sponsorship opportunities. If you're not sure which tier is the best fit for your organization, we encourage you to attend Membership 101; which is held the 3rd Thursday of every month. Please check our News & Events for posted events, as these dates may change periodically. If you would prefer to schedule an appointment, please call 410-825-6200 or stop by the chamber during normal business hours. We look forward to the opportunity to discuss which option works best for you!